As told by his mother Dhanya. 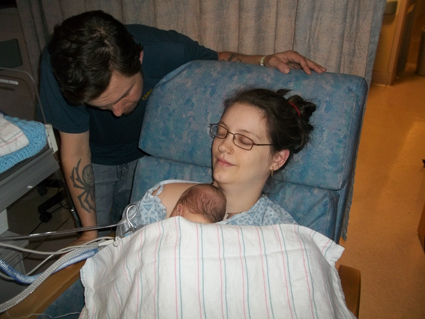 We wanted to have a homebirth with our first son but couldn’t afford it. He was a week late and we declined to go in for an induction that Friday but then non-stress testing said the amniotic fluid was low so we made an appointment to go in at 5am the next day to be induced. I went into labor Friday night and things were picking up steam when we got the hospital (My mom, husband, doula and myself). We labored pretty naturally for most of the day and didn’t get any pitocin until the evening. The back labor was pretty intense. Then after a totally refreshing nap compliments of Stadol, the nurses woke me up and I hopped into the stirrups to push for about 2.5 hours. I saw baby’s head in the mirror! Dr.Koh came in and saw that the baby was OP so he got us all to prepare for a C-section. Dasaratha was 9 lbs 6 ounces, 21 inches and super awesome. Champion nurser. • Shridam was due September 16th, 2012. We didn’t want to have another C-section this go round and now we were in a position to afford midwives. We interviewed a few groups and went with the same midwives a couple people we knew had delivered with. We saw them for the regular checkup stuff, heart tones, measurements, weigh-ins, etc. and my seemingly endless list of questions about homebirth, pregnancy, transfer and nearly everything else under the sun. • For backup we saw some hospital midwives who work with M and R and take care of some of their transfers. I went to their clinic for all of the blood tests and ultrasounds. I had endless questions for them too. I was told by them and our homebirth midwives that we would transfer to that hospital in case of something like exhaustion or dehydration but that for an emergency emergency we would go to Heywood, the hospital 20 minutes from my house. • The pregnancy covered the best summer of my life, my husband, our toddler and everyone we knew was just so happy and excited that we would be getting a little baby boy. Stava and Dasaratha were able to accompany me to most of the prenatals this time which was really special. I was crazy healthy and felt great. • We went into labor Friday night but it stopped as soon as M got there. She left and told me to try to get as much rest as possible before things picked up again. I had light contractions until Saturday evening when things got hot and heavy and the two midwives came over again. We had my grandmother take Dasaratha to his Uncle and Aunties while we set to laboring. I see the hand of the Lord in that because we had considered having him babysat at our home but couldn’t think of anyone to watch him. I labored leaning on Stava and moaning with him for awhile, at a certain point I was saying, "These contractions are stronger than me, I'm not handling them well," and I decided to get into the tub. What GREAT relief! In my first labor I kept wanting to take a shower but we couldn’t get the monitor wet so I opted for Stadol instead. Anyways no back labor this time, baby was in perfect position very low, NOT occiput posterior (I was super afraid he would follow suit like his brother and religiously did my positioning exercises while pregnant). They checked his heart rate regularly the whole time and he was happy as a clam. We put on the birth CD my friend had burnt for us. The water made contractions so much more manageable, Stava was in there with me sometimes I would lean on him sometimes I grip the sides of the tub and stretch out. Eventually I felt the urge to push and started to do that. I was a little insecure thinking I didn't want to push if I had a lip of cervix so I hopped out of the tub and had my midwives gives me an internal exam (the first and only). I was 10 cm so I hopped back in the tub and began to push for all I was worth. Pushing was about 2hrs but isn't seem very long at all, not like Dasa's. No one was yelling at me; I pushed not on every contraction but when I got a "good pushing one" I would say, “This is it!” and grip the side of the tub stand up on my knees and holler and push. I reached down and felt baby's soft head, it was awesome then I had Stava feel too. The midwives were checking his heart rate with the Doppler pretty frequently now (I appreciate that now but at the time it was sooo uncomfortable!) and it was right where it was supposed to be. I vaguely remembered being blood pressure cuffed throughout the birth but I didn’t pay that much mind. Sometime during the pushing I felt the water bag POP and the midwives rushed over to the birth tub with maglights to check the amniotic fluid; it was clear. At some point I felt like my pushing was becoming a little less effective and the midwives suggested I hop onto the birth stool. That REALLY directed the pushing energy, 2 or 3 pushes on that and I had his entire head out! I was done at that point, I asked if I still had to push because I had read birth storied where the midwives help ease the body out of the exhausted mother and though that sounded good I said, "Do I need to push anymore?" My midwife said yes, "You need to push with everything you have." Then they said, "You need to get on hands and knees." *Sh*t* I had read enough birth stories to know that meant shoulder dystocia. I got onto hands and knees and pushed hard, thinking they would be able to hook him and pull him out. They told Stava to call 911 and then had me get standing upright to push. Then I was lunging, standing, hands and knees, on my back with legs pulled all the way back and supra-pubic pressure applied. We tried all these positions rapidly AGAIN and AGAIN. M and R were taking turns trying to hook the baby, and alternating putting the oxygen on his face and then on mine. I kept screaming, "I can't push anymore," because I was exhausted or "I'm still pushing!!!" because I WAS still pushing and felt no give from the baby. I screamed a lot and there was blood everywhere, all over me, saturating the floor. Stava said, "They had to tear you apart to get to the baby." I didn’t know it at the time but Stava then left to flag the ambulances at the end of the drive. He feels like he didn’t do anything to help the situation but they may never have found our hidden drive on that dark and rainy night if he hadn’t gone out there. We just kept going in those positions. It was excruciatingly painful, I screamed and screamed and pushed and pushed. Eventually the ambulance and EMTs arrived. I thought we were going to go to the hospital, I was screaming things like, “Can we got to the hospital now? Get him OUT!!! but the EMTS and midwives told me I had to deliver the baby first. I hadn’t expected that. The EMTS were really awesome; they took over the oxygen and focused the midwives saying, “You can do this, you can get this baby out.” FINALLY he came out, with me in the hands and knees position, at 1:42am on Sunday, twenty minutes after his head had been born. He looked so small, and even though he was all pink and peach, without a tinge of blue on him I could tell he was lifeless. He was so limp and floppy. Shridam wasn't breathing and had no pulse. The EMTs began CPR and intubation immediately. I was sure that he was dead. My own heart rate was at 200 and the EMTS were instructing me to focus take deep breaths, calm down. The midwives gave me two shots of pitocin in the thigh and some Chinese herbs to stop bleeding. We each got loaded onto an ambulance. I nearly passed out as they took me down the stairs, because my oxygen mask had fallen off. Stava and all but two of the EMTs (we had first repsonders from like 5 towns) piled into Shridam’s ambulance and R and two EMTS went into mine. As I rolled past Shridam's ambulance they told me he had a pulse. I couldn’t believe it, I was so relieved. It came twenty minutes after he was fully born and they started working on him. From there we went to the ER at Heywood, Stava was sobbing on Shridam’s side of the room and my heart was stricken fearing for the worst. They did all kinds of things for him, that I’ll never know the whole of, they managed to get an IV in his belly button. They gave me three IV ports and pumped me full of blood, pitocin, morphine and two kinds of saline water. My placenta still hadn’t come out so two nurses massaged my stomach almost right down to the bed and Dr.R, come down from the maternity ward, reached in and grabbed it by hand, delivering the whole of it successfully. I had 3rd or 4th degree tears (I would hear from doctors in the next couple days) and Dr.R stitched me up into a, “patchwork quilt.” It hurt so much because apparently, like novocain, litocaine is totally ineffective on me. R was in with me but they wouldn’t let M in and I was so out of it I didn’t really care. A few hours later we both transferred to a bigger hospital with a level 3 NICU, and they cooled Shridam’s body for 3 days to try to keep brain damage as low as possible, but his brain was just completely gone, 40 minutes of oxygen deprivation was too much. 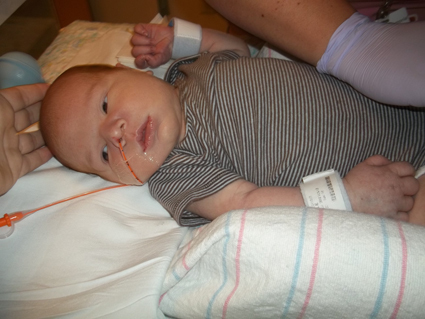 He was 23.5inches 10 pounds 15.4 ounces when the weighed him. I finally got to hold him when he was 3 days old. He never cried and could only move his arms and face a little. The told us his EEG and MRI showed no brain activity and that he would not live for long. 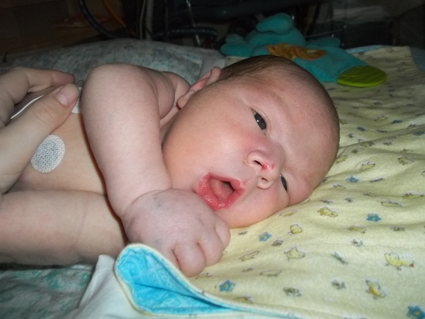 That Friday he managed to knock his arm into his ventilator tube, unpositioning it. We decided not put it back in and he breathed on his own until early Sunday morning when he gently died in my arms, one week old. There are many other stories and miracles that accompany his short week of life, but they are too numerous and hazily remembered to list here.